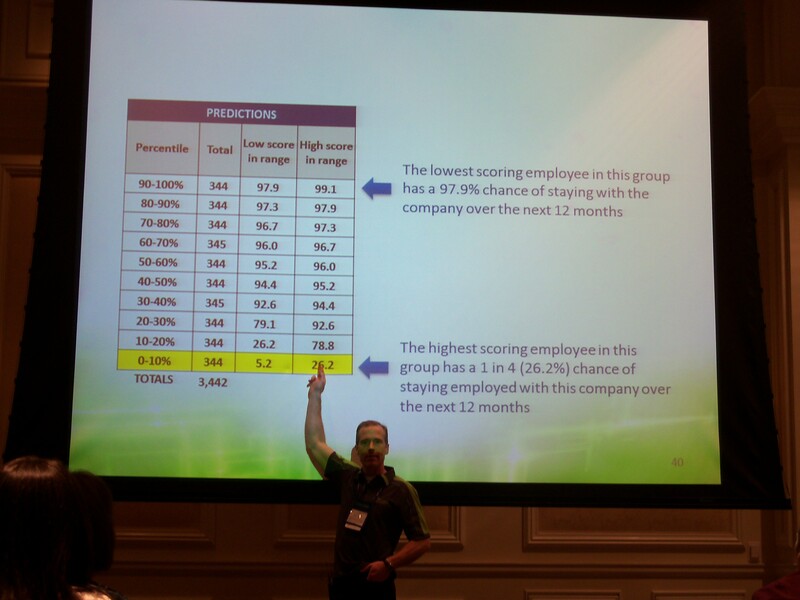 At the recent Ultimate Software user conference in Las Vegas, customers were briefed on new predictive analytic capabilities being incorporated into the Ultimate HR software product. Ultimate Software Predictive Analytics – Copyright 2012 TechVentive, Inc. The following text represents the best notes I could take as the subject was covered rather quickly at the event. Ultimate Software developers worked with a client that had approximately 3445 employees. They analyzed several years worth of attrition data to determine if there were any common indicators that could be used as predictors of future retention. Five factors emerged (out of 150 total factors examined) that correlated with 85% of the actual attrition customer had experienced. Predictive Analytic work steps – Copyright 2012 TechVentive, Inc. 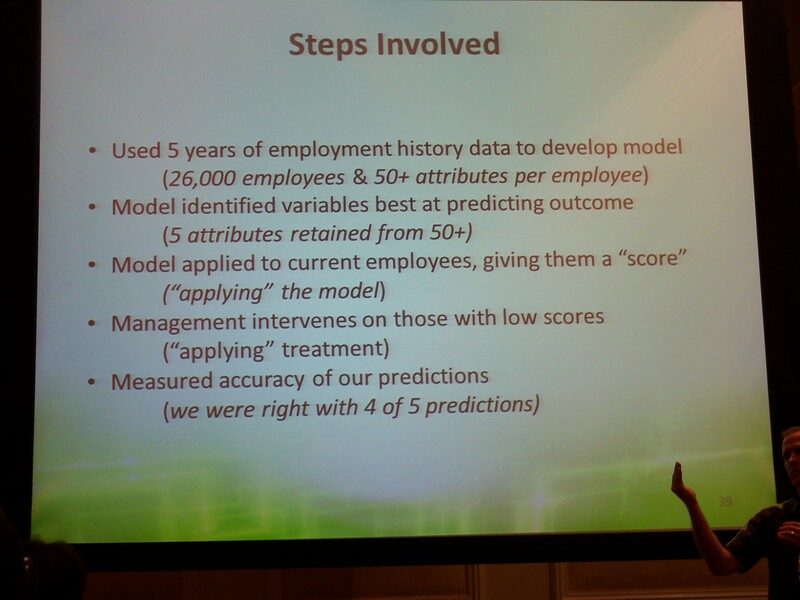 The predictive analytics module then scored all employees against these five criteria. Ultimate software ranked each of the 3445 or so employees. They then broke the employees into deciles from lowest scores to highest scores. In the lowest-ranked decile, one employee was singled out as having only a 5% chance of staying with the company through the next year. The highest score of any employee in the bottom decile was only 26%. Clearly this 10% of the workforce was at great risk of leaving their employer. The analysis also showed that the second decile wasn’t much better. The employer clearly had a lot of work to do with this portion of its workforce population. Forward Looking Analytic Results – Copyright 2012 TechVentive, Inc.
Interestingly, the individual employees within these 2 deciles contained a number of high-performing individuals and high potential individuals. This additional insight was gained once the predictive analytic results were triangulated against the performance management data within the HR system. According to Ultimate Software executives, their customer’s management team was stunned to find a number of high-performance and high potential employees at risk for leaving the firm. Eventually, 78% of the workers indicated as potential flight risks did in fact leave their employer. While this clearly shows that the predictive analytic tool was focused on many of the right factors, it does, to me, indicate that the management of this company either acted too late or did not understand how to effectively intervene with individuals to minimize these attrition losses. Some lower paid employers may see a high correlation between retention and the price of gasoline. That is, the higher gas prices move up the less affordable some jobs actually are. Anecdotal “evidence” offered up by company executives can often be wrong. a competency built around speedy intervention once analytic results have been identified. Businesses that develop great analytic tools but fail to move quickly on the results are simply wasting money. I have recently covered other HR analytic tools (e.g., Visier and Evolv-OnDemand) and will continue to highlight additional analytic applications as they bring new value to staid back office processes. The future, excitement and business value to emanate from many finance, HR and other applications will have to come from products, like predictive analytic tools, as these can have material bottom line impact. In the example that Ultimate Software demonstrated, reducing attrition materially reduces recruiting, training and other costs. The value is clearly there for firms willing to find it.